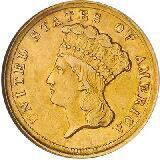 No varieties are known or expected, as all 1854-D Three Dollars were struck from the same pair of dies. The mintage for this date was a mere 1,120 pieces, making it one of the most desirable dates in the series. It is the only Three Dollar Gold piece minted at the branch mint facility in Dahlonega, Georgia, adding an extra dimension of desirability. NGC MS-60 (illustrated below). Ex - Superior Galleries' "Pre-Long Beach Sale", June 5-7, 2000, Lot 2162, "muted luster with characteristic weak rim denticles, although the centers compensate for this by their sharpness; full denomination, date digits and mintmark are an expression of the central detail", sold for $47,150.00 "to the book"